If you are just starting out into the world of vegetable gardening, the last thing you will want to do is choose hard to grow vegetables. My list of the best Vegetables for beginning gardeners will help you to choose those with the greatest chance of success. If you don’t have room for a large vegetable garden in your yard, do what I did last year. 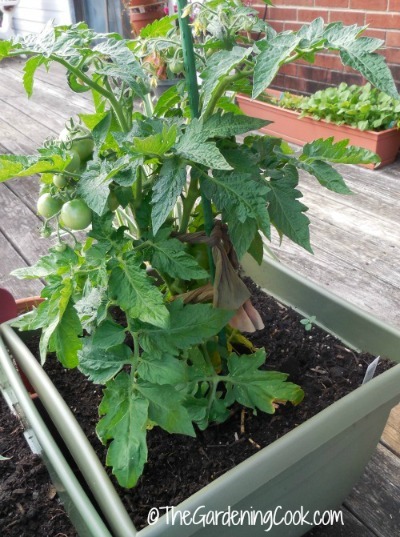 Make a deck garden and grow vegetables in containers. It’s a great way for beginners to get their feet wet with vegetable gardening. Get a Good Harvest with these Best Vegetables for Beginning Gardeners. Sure, you may love asparagus, but will you want to wait until the second year before you can cut any and even then, only just a few stalks? You may love fresh corn on the cob, but if there are squirrels in your neighborhood, growing corn will attract them in droves. Ask me. I know. Long story. 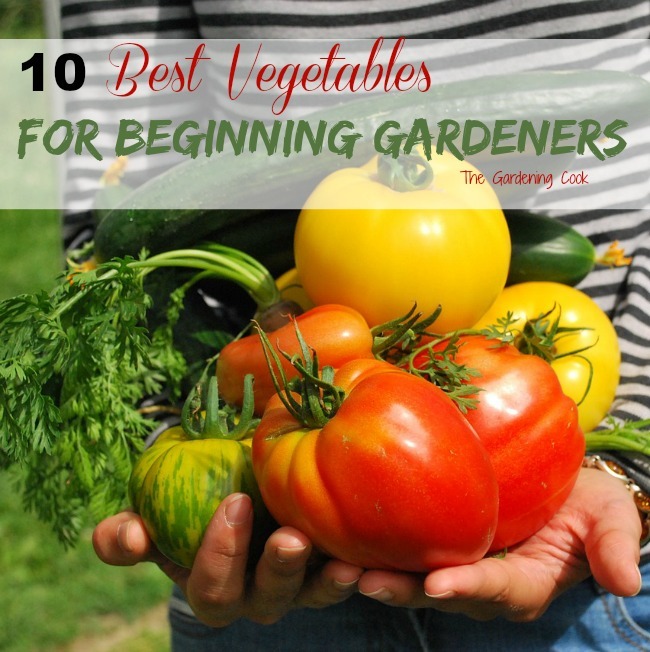 My top 10 Vegetables for Beginning Gardeners. If you are just starting out and want to grow some vegetables that are both reliable and easy to grow, the 10 vegetables in my list are a great place to start. All of them will grow fairly easily with good results and not too any problems. So, use my tips, have fun with gardening and enjoy your crop in a few months. 1. 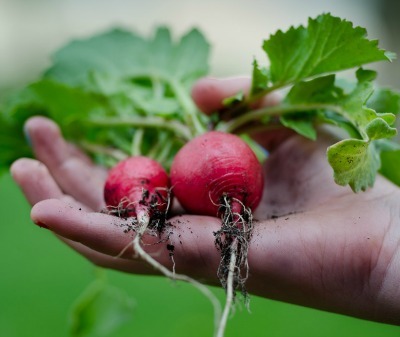 Radishes – This is the easiest of all the vegetables to grow and it’s perfect for children. Most varieties are ready to eat in about 20-25 days or so, so succession planting is easy. The biggest problem I have had with radishes is that caterpillars like the leaves, so you have to keep a look out for them. 2. 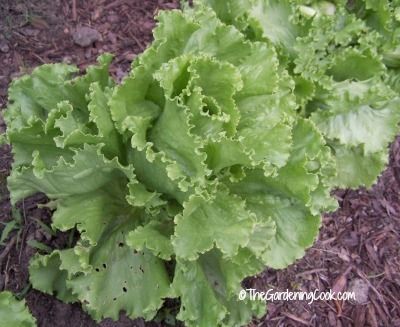 Salad Greens – Another fast growing vegetable, all types of salad greens are easy to grow. They do best in cooler climates, so if you live in the hotter zones, you will do better with them in the spring and fall of the year. They are a cut and come again crop too, so one planting will keep on producing all season. 3. Tomatoes – Tomato plants grow quickly and bear a lot of fruit quite easily. For best results with new gardeners, try growing determinate plants (which won’t need as much staking), or cherry tomatoes, which also seem to keep to a fairly compact size. See my article on the dos and don’ts of Growing Tomatoes. 4. 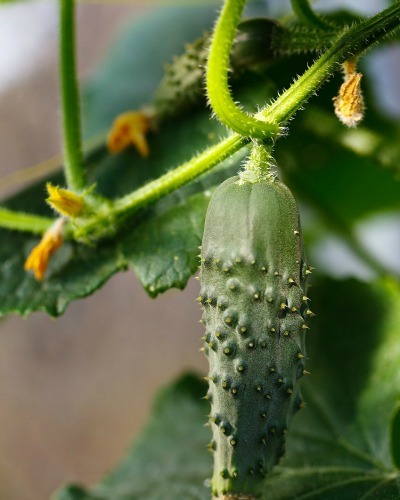 Cucumbers – Cucumbers are a great choice for container gardening. They will grow up, with support, and as long as you have direct sunlight and water them regularly, you will easily get a bumper crop from them. Both normal size and baby cucumbers are easy to grow. 5. 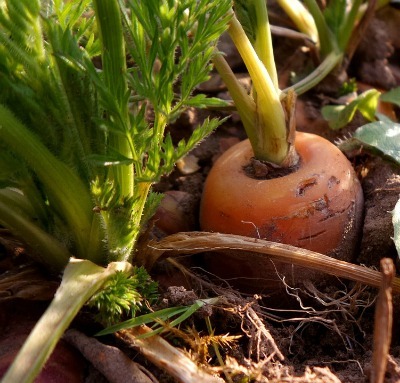 Carrots – As long as you have good well draining soil, you will have success with carrots. They probably won’t grow as large as the ones that you see in the grocery store, but they are easy to grow and so sweet and delicious. Kids will love the funny shapes that they sometimes take on too! 6. 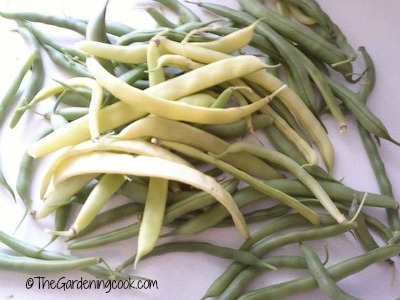 Bush Beans and Pole Beans – all types of beans are great for beginners. Bush beans are compact, do not need staking and grow very easily with few problems. I find the green variety easier to grow than the yellow ones (which explains why yellow beans are not as easily found at the grocery store!) Pole beans are also easy to grow as long as you have some support. See how to make a DIY green bean teepee here. If you are curious about the differences between pole beans vs bush beans, check out this article. It gives lots of great growing tips for both types of beans. 7. 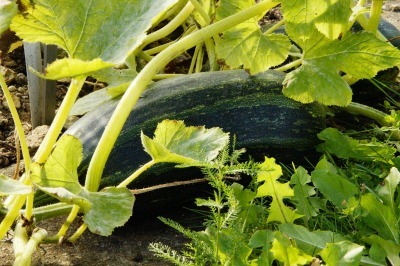 Summer Squash – zucchini and other forms of summer squash grow so easily that many seasoned gardeners get sick of them by the end of the harvest. Be warned…you will end up with enough to feed the neighborhood! But don’t fret about that. See my 25 recipes for using zucchini here. 8. 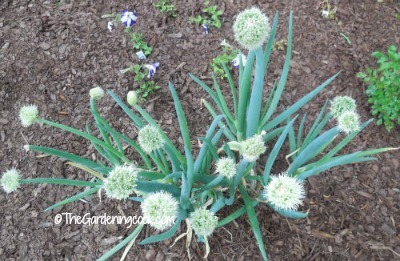 Spring Onions – Another cut and come again vegetable, spring onions are super easy to grow. I live in zone 7b, and mine have been growing for 3 YEARS from one planting. I just keep cutting them when I need them and more grow. Very simple vegetable. Both the bulb and the stems are edible too. 9. 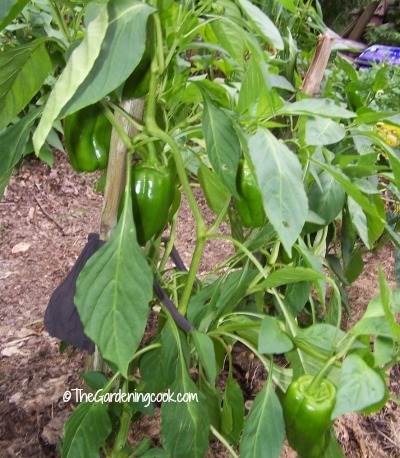 Peppers – Both Bell peppers and sweet peppers are very easy to grow. If mine get floppy, I just add a stake and tie them up with pieces of nylon stockings. For the beginner, they are best grown from seedlings rather than seeds, but I have done both successfully. The seeds just need longer to grow but are still easy. Leave the green peppers on the vines long enough and they will turn red. 10. 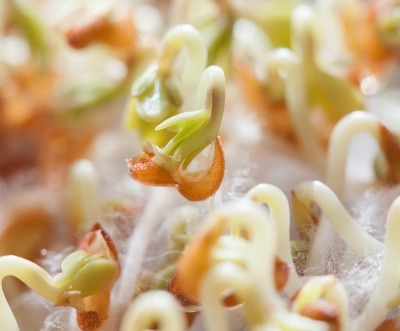 Sprouts – Any kind of sprouts are an easy to grow vegetable that is great to add to salads. They don’t seem to suffer from pests or other problems. Just scatter the seeds and a very short time later the sprouts will grow and be ready for a tossed salad. I would love to win this! Living in an apartment has been such a drag and if I could just get my hands on the equipment to start up my own little garden on the balcony.. it would make my year! How I would love to have pole beans from your great grandmother’s plant! Thank you for another wonderful giveaway! i just retired this year and want to learn how to grow my own organic vegetables. I have never grown anything and need to learn a lot. Thank you for the help and advise on your site. It is, in reality, a great and helpful piece of information. I’m happy that you just shared this useful information with us. Please stay us informed like this. Thank you for sharing.